Who doesn’t want to have fuller, luscious, and kissable lips? Women have always thrived to develop and try new techniques to enhance or improve their lip shape to appear more sensual and attractive. Young adults desire to have lips enhanced, but as they get older, lips usually get smaller and thinner, and the desire is to simply regain and restore what was lost. This desire is no longer a dream but a really quick and easy accomplishment! Women spend hundreds to thousands of dollars to enhance or restore their lip shape. This is done through different types of cosmetic products that plump, suction, contour, or even tattoo. Of course, the latter being the most aggressive and enduring. This list can go on and on, but the truth is, that none of those treatments are long lasting as they are superficial and require daily application. Who has the time for that? Don’t you ALWAYS want to have great lips as opposed to only after you put make up on? She will perform a lip augmentation treatment that will take 15 min and will last from about 6 months up to 2 years, so you can forget about daily lip pencils, lipstick plumpers, contouring and simply enjoy your kissable lips every minute, every hour, every day! How long do results after lip augmentation last? How long does lip augmentation procedure take? 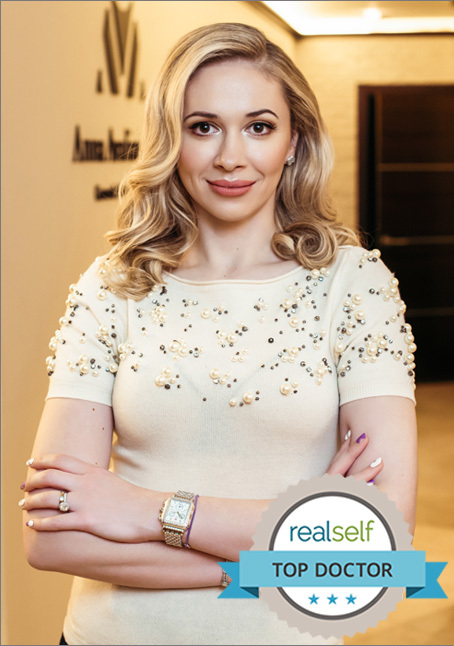 Dr. Avaliani is a perfectionist and really takes her time while performing her procedures. She cares about patient comfort level and satisfaction. The procedure usually takes 15 min to perform, but there should be an additional 30 min of numbing to minimize any discomfort. There is absolutely no pain or discomfort as Dr. Avaliani will place a specially deigned numbing cream and will let it take effect over 30 min. The only thing one may feel would be pressure, but there is absolutely no pain. Will I have any bruising after my procedure? With the help of Accuvein, Dr. Avaliani is able to directly visualize small, large and medium blood vessel located directly under the skin, therefore decreasing any potential for bruising or bleeding from your average 50/50% chance to less than 1% chance. Dr. Avaliani will assess your facial symmetry and provide recommendation about the the type of product she will use depending on your desire. Dr. Avaliani believes that a successful consultation involved both the doctor and the patient working together. She asks that you bring a photograph of the type of lips you are looking for. It is very important to understand that sometimes, more than one treatment will be necessary to achieve the optimal results one is looking for. It depends on the type and quantity of the product to be used. On average, it can range between $500-1150. The price will be presented to you at the time of your consultation. Yes, Dr. Avaliani has a reversing agent to dissolve the product in case one desires it, whether it was done by Dr.Avaliani or elsewhere. Immediately after, there is no downtime, however, the product naturally draws water , therefore significant swelling can be seen the next day, which will be gone in less than 24 hrs. What are the most common side effects after lip augmentation treatment? Redness, bruising, and tenderness and swelling are the most common side effects. Occasionally, small lumps/bumps can develop and are very transient and go away on their own in about 1-2 weeks.